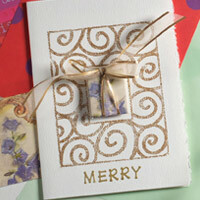 Get Creative for the Holidays and Make Your Own Greeting Cards! Create your own cards this holiday season! Strathmore makes it easy with their complete offering of blank cards and envelopes. Draw, paint, collage, print, stamp or even use your inkjet printer. Jerry’s offers great savings on Strathmore Creative Cards, Photo Mount and Photo Frame Cards and environmentally-friendly Greener Options cards. Check out Jerry’s complete offering…..